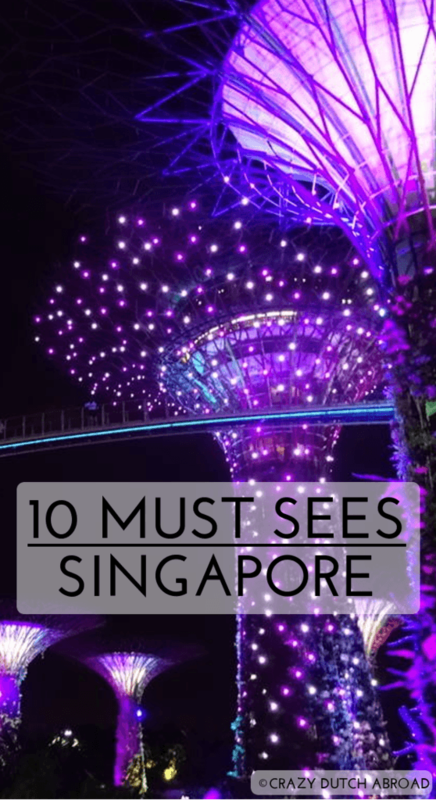 10 MUST SEES IN SINGAPORE! How to apply to all the rules? With all the laws and rules, and fines for breaking them, I wanted to see Singapore with my own eyes. After many transit visits to the incredible and must see Changi Airport it was time to actually leave the airport for a long weekend in this Asian mega city. After visiting I can say Singapore is futuristic, there is really no chewing gum around and there are rules all over. The streets are as clean as the fines are high and there are many officials checking up on you. It is incredible. Here are a few photos I took of Singapore that really impressed me. From left to right: Marina Bay Sands Hotel with the highest swimming pool in the world, the clean and super organized metro system (MRT), free wet umbrella (2 sizes!) wrappings at the entrance of public areas, clean streets and everywhere you look you can find trees mangled with architecture. This depends on where you go in Singapore. The touristic and public areas are definitely super clean! We used the MRT and the public bus a lot, it is cheap, fast and convenient. The buses run often and are spacious, clean and heavily air-conditioned. Before you move up the stairs to the top deck in the bus you can check on a screen how many seats are left. In the MRT you can see clearly where you are going, at which side the next station exit will be and you can send a WhatsApp message if something is wrong. It is not super clean everywhere. We stayed at Geylang area for example, where you can find garbage on the streets and dirty areas - but nothing like in any other Asian city! The first rule I broke without being aware of it was drinking water while waiting for the metro to arrive! Luckily I 'just' got a friendly warning. You can not eat or drink anything around public transport. There were no bins around the whole public transport system either and rules for littering, so good luck with your waste. If you take a look around, especially in public areas, you will find signs with rules and regulations everywhere. It looks like over-regulated and it seems that everybody is happily living by those rules. Maybe this is one of the reasons why I felt really safe as well. The social system is enormous so I guess if you stay on the right side this is a great and safe place to life. With only a few days in Singapore I felt really welcome and applying to the rules was merely using common sense. Check number 3 on the Cable car rules: "There's a change you may meet with bird "missiles". Make sure to hold on to your balloon and the well explained water park dress code. Another great help is that activities are made 'extra safe'. From 'hold the railings' to 'mind the gap' (while there might be a gap of max 2 cm), everything is mentioned and hard to miss. Extra safety barriers and guards on 'dangerous' corners you can spot everywhere. This is different from all the other places in South-East Asia I have seen, it looks more like the US, Australia or New Zealand. We went to the water park (see below) and there were lifeguards next to the pools every 5 meter and employees managing the entrances and exits of all the glides. The traffic light controlling the stop and go apparently is not enough. Overnight stays in Singapore are expensive. By searching online to find a double room with air conditioning I ended up with dorms or capsules for our budget. Those capsule hotel rooms look like mortuary to me, not my cup of tea. So, we tripled our nightly budget and stayed in a cheaper area. We found a good 'deal' for 72 Singapore Dollar per night for a private room of 15 square meter in the red light district of Geylang, about 800 m from the MRT (metro / Mass Rapid Transit). Even though we were warned about the area, it felt completely safe during the night. There are a few cheap and good restaurant around. Those places are typical Asian: Bright lighted, not super clean and most of the time you will sit on plastic chairs while being served with disposable plates and cutlery. As long as you are aware of this or if you have traveled a bit on a budget before, it's all good. Lau Pa Sat at Satay by the Bay, amazing Thai restaurant on Geylang Road and Ju Shin Jung Korean Barbecue. Skipping most of the highlights and tourist attractions is a way to save money, but hey - that's what I wanted to explore! For us the whole point was seeing what Singapore has to offer. The entrance fees of some highlights are expensive as well as the food and drinks in and around those places. Not really surprising I know, but maybe 20 Singapore dollar for a pint of beer is?! If the buildings are high the prices are high - but hey, this must be the most accessible place in South-East Asia for draft beer! At this point we stopped complaining about the money and paid for the things we wanted to see and do in order to enjoy ourselves in Singapore, as we did! Here is my advice if you have some money to spend on a few days in Singapore! Visit the two sky bars for sunset, first Ce La Vi (inside Marina Bay Sands Hotel) and than One Altitude Bar. You can enter the Ce La Vi Sky bar (first two pics) for free if you order a drink. There is a separate viewing deck you can enter for an additional fee. The funny thing is that this looks like first and second class. Remember the scene from Titanic?! One Altitude Bar is much higher and you have a 360 degrees viewing deck. Here you pay an entrance fee of 30 Singapore dollars including one drink. Do not think you paid enough to sit down on one of the couches. Explore the high-end area of Marina Bay. Visit the mall and check the latest designs of the haute couture fashion stores. Check the Venetian boats cruising through the mall. Visit Gardens at the Bay for their Light show (every day at 7:45 pm and 8:45 pm (free of charge)) and have a cheap dinner at the hawker stall at Satay by the Bay. Shop for traditional Chinese and cheap souvenirs in the China Town market. Have less touristy drinks in Club street, around China town. Stroll around Boat Quay for a posh boulevard feeling and dining at the waterfront. The prices vary a lot so shop around for your budget and favorite food. Have lunch at one of the curry houses in Little India, I recommend 'Leeds'. Visit the market for cheap groceries. Walk around Arab Street to check the Arabic influences and products on sale. The Kamppong Glam Heritage Trail is new and super clean, it looks a bit like a theme park to me. Enjoy the entertainment of Sentosa island. Now this is the ultimate 'PLASTIC FANTASTIC' area of Singapore! You will be entertained from start to end. The cable car gives you nice views and the 'full experience', 1 round trip is about 29 Singapore Dollar including a free gift! (and it is NOT the taken picture in a frame) There is free shuttle service (after paying the island entrance fee) and there are some nice beaches along the shore. Have a look at the contrasting container ships! If you enter the Adventure Cove Water Park you pay 36 Singapore Dollar entrance fee, 10 Singapore Dollar for a locker and 14 Singapore Dollar for a fast food meal. We waited about 1 hour for each slide on a non-holiday weekday. Since we paid for a round trip with the cable car we ended the day in Faber Peak, where I found the Bell of Happiness! Let me know if my travel information and tips are useful to you!